Wonderful colours on your tag Denyse.. This looks awesome Thank you for sharing with us over here today at the Classic Open Design Team Challenge and best of luck with your entry. Your tag is absolutely stunning! The colours are fantastic and you really have created some wonderful textures and those images you added are beautiful. Oh this is so beautiful. I just love your gorgeous colours and design. Lovely work. Fantastic tag .Love your colours. Thanks for sharing with us at Creative Moments. Wow! It's a stunning tag Denyse! So inspiring, and gorgeous colours! Such gorgeous summer time colors on your textured tag! I love those butterflies! Thank you for sharing your amazing artwork with us at A Vintage Journey! Hugs! What a fun, colourful tag! Love the colour combo as well! Gorgeous Mixed Media tag! I love the colours and the butterfly and, of course, the word! Thanks for joining us at Country View Challenges this month. Wow I love the zing of the colours and textures in this tag. Love your project, thank you for joining us at Classic Open Design Team Challenge. 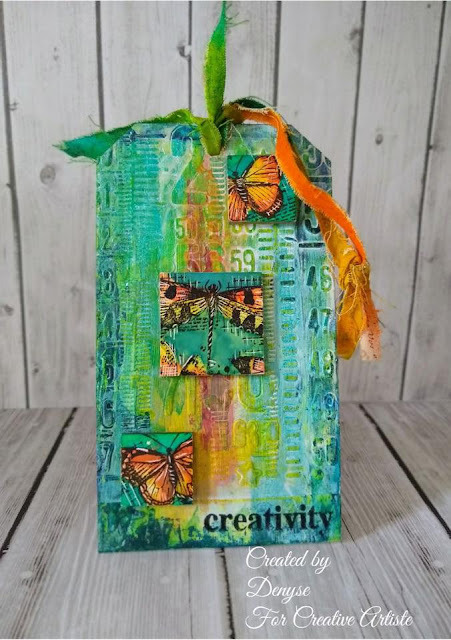 I love this bright and beautiful mixed media tag! Those butterflies look fabulous! Thank you for the inspiration! And I'm so tickled to see you played along at A Vintage Journey, so thank you for that, too! Hugs!